Moist and full of flavour, homemade burgers beat frozen patties every time. I like that I can control the portion too. Some frozen burgers are too large for an adult, never mind a kid! I want to eat more than just a burger for my meal. Big burgers need big buns, and big buns need more salt-rich condiments…forget it! Give me a smaller, tastier burger any day. And please pass the veggies! Kids Cook! Get your kids involved in the kitchen by having them help out with this recipe. Here’s what they can do! * Have them help measure out the breadcrumbs and diced bacon. Kids love to beats eggs, and shred cheese That's half your prep, done! Dietitian's Tip: Yes, these burgers have bacon, and I generally advise that we cut back on salty processed meats. But look, ¼ cup (60 mL) in 6 burgers or 2 tsp (10 mL) each is not much. You don't need a lot of bacon to add a lot of flavour. Instead of offering bacon as a topping, cook a little into the burger to add moisture and flavour. 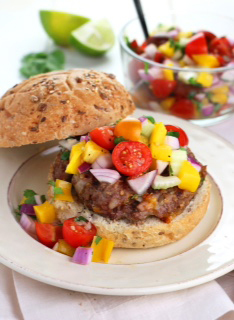 Make the Market Fresh Salsa to top the burger and a platter of more veggie topping options. That's the 80:20 rule in action! Divide meat into 6 portions. Form into ¾ inch (2 cm) thick patties. Make thumb-print depression in centre of each patty. Don't think oh thumbprint whatever! That's the trick to keep a flatter burger shape. Have you ever cooked homemade burgers and they come out more like big meatballs? Make the thumb-print folks! Grill over medium heat on preheated, oiled grill for 5 to 7 minutes per side, testing doneness with a digital instant-read thermometer inserted sideways into centre of each patty to ensure patties are cooked to 160°F (71°C). Remember this rhyme - your burger is done at 71°C. Top with Market Fresh Salsa. Hooked on tasty homemade burgers?! Once you have all the ingredients out it doesn't take much more time to bang out a big batch of burgers compared to a smaller batch. Save some moolah by making these when lean ground beef is on sale. Here's a basic recipe (again from Canada Beef): 4 lb lean ground beef, 1 cup EACH dry bread crumbs and minced onion, 4 eggs, pinch salt and pepper - easy to remember right? That's the basic recipe, now go crazy with your own add-ins! Make 16 x ¾ inch (2 cm) patties. Place patties in a single layer onto several plastic wrap-lined baking trays; cover loosely with plastic wrap and freeze just until meat is firm (1 to 2 hours, you don't want to be trying to get floppy burgers into a freezer bag, make sure they are firm). Wrap patties tightly in heavy foil or place them into freezer bags and freeze for up to 3 months. Have fun inventing your own signature burger! This is how restaurants add another 6 bucks onto your burger price: they add a tbsp of feta, some lemon zest and chili peppers and call it gourmet. Bah, do it yourself at home! Think of all the flavour combos that you can't get from frozen store bought patties. Let me know how you made out and please share your signature burger ideas here too! * mix all the ingredients in the bowl, naming them one by one. The best way to avoid safety issues, I find, is to avoid rushing and limit multitasking. Keep an eye on your child and stay focused on guiding and praising them. Dietitian's Tip: Would you have guessed that a whole yellow or red pepper has 4-5 times more vitamin C than an orange? In a small bowl, mix halved grape tomatoes, sweet pepper, shallot, garlic clove and minced chives or parsley. Add lemon juice, olive oil and liquid honey. Season with salt and pepper; stir gently to combine. Will keep for 5-7 days in the refrigerator. After dinner make up these quesadillas for lunch while all the ingredients are handy, the kitchen is already a mess and the kids are around to help out…many hands make light work. Kids Cook! Get your kids involved in the kitchen by having them help out with this recipe. Here’s what they can do! * This recipe is so kid friendly! Have them help shred cheese, spread the leftover cheeseburger and spoon the salsa in. All you have to do is cook it! Top a large whole-wheat tortilla with cheddar on one half and crumble leftover burger on top of cheese. Add a dollop of salsa and fold over to enclose. Heat in a skillet, turning to cook both sides until cheese melts and tortilla is golden brown. Cool before packaging in lunch. Microwave warm at lunchtime or eat cold.